motocross go - the dirtbike arcade videogame. The History of Motocross Go. Namco got its beginning in Yokohama operating children's rides at a department store. Parents like to make their children happy and a small amount of money for a treat is not a hardship. A goldmine awaited in the design and distribution of video games such as Motocross go. Namco released its first arcade game in 1978 and quickly became one of Japan's top manufacturers. At first, the company depended on companies such as Atari for overseas distribution, but later took over that part of the business. Pac-Man was released in 1980 and is Namco's biggest selling hit yet. Dozens of games were developed by the company long before Motocross go was released. How prepared were people for a motocross arcade game in 1998? A generation had completed an earlier game from Atari called Atari Stunt Cycle, which was also sold at Sears as Sears Motocross 1977. Arcade games offered the opportunity for noise, skill and fun. In other words, the game-playing world was ready. This game was popular because it was fun. Kids or adults could sit on the motocross bike seat to watch the screen and handle the controls. Three different games delivered various scenarios and action. Drag Race was the easiest game, as the goal was to go fast, work through the course and finish without mishap, such as sliding on your head when moving too quickly. Another game in the series, Motocross, involved pulling a wheelie to make it over a barrier. The third game, Stunt Cycle, provided the chance for jumping obstacles, in this case busses. The idea was to accelerate up the ramp and start by jumping eight busses. Every time a jump was successful, another bus got added. At some point, the bike lost traction and slid, ending the game. In an arcade setting, the game could be linked up to four machines. Multiplayer action brought a sense of victory to the winner and the desire to win next time to the runners-up. Motocross go was not Namco's top seller, but it produced a great deal of competition and excitement for those who played it. Videogame time for the MX rider. 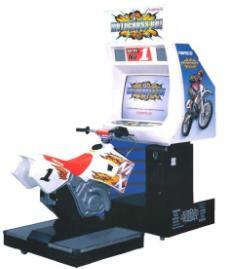 Motocross go was an arcade game by Namco. This videogame was around in the late 1990’s, and you could sit on a plastic prop bike in front of the arcade game screen, giving a great feeling of riding a real dirt bike. It had a twist-and-go accelerator handlebar, so ideal for the beginner wanting some easy excitement for a few minutes. 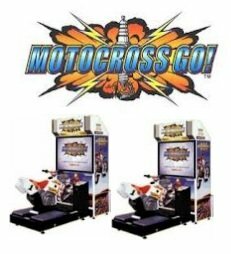 Motocross go was produced by Namco in 1998. This MX Videogame, features off road sport bikes and dirt bikes racing over a number of obstacles. The motocross game was on wide release in 1998, and has a design which might look dated by today standards. But was of its time. Most kids that played it raved about the dirt tracks & race gameplay and high peak skills needed to get onto the next level. The Single Player arcade videogame, shows off the bikes to the max. The motor bike controls are simply Throttle & Brake. While the steering is tilt left, tilt right. Pretty straight forward for a scrambler computergame - and you can start competing immediately. Bike Cheats – let’s go! Secret bikes on motocross go. When selecting the sports bikes, while turning the bike handle to full throttle and holding the brake, select your dirtbike with the view button. The YZ400 gives you a transparent player with a visible heart. The YZ250 gives you a player in a racing black jumpsuit (very fast!! On the practice track). Race Alone on the bike track. Hold brake, gas, and view while you insert your coins. Keep them pressed until you start the race. You now have a racing bike at any level to test your shocks and tires to the limit. You’re unlikely to pick up any real motocross track tips for your real motorbike. But a MX game, or an arcade videogame like this one will help with eye/hand co-ordination. Also look out for tiger games' mx dirt rebel, and the many other free flash games online. As long as you’re in dirt bike heaven, who cares if it’s a computer-game or a track field bike with a real gutsy engine! Motocross Go with one hand. When you want the REAL experience. A game like “motocross go”, can really wet the appetite for more thrilling action on real motocross bikes. 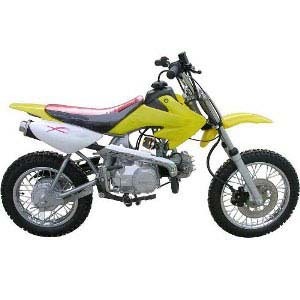 If you do want a real dirtbike ride – you should buy a dirtbike or perhaps a smaller pitbike that you’ll feel comfortable with. A cheap inexpensive used bike that’s been cared for should be your first bike, and a new helmet to go with it. Try somewhere like freecycle.org for a free dirt bike – but you’ll be very lucky to get a free mini motocross bike – as they’re so cheap anyway. Sure you can ride your new bike on some common land, but a designated track with jumps and corners is much better to hone your skills. For a small daily price most tracks are accessible plus you get to talk to the other riders and owners who will teach you more in a day, than you’ll find in a dozen magazines. However you GO about it keep it safe and build your confidence gradually.